This is the single version of my Ashley Cataline Double Bed. It is actually based off of an updated version I made that is smoother than the original. I haven't uploaded the newer double bet yet as I need to get screen captures and I'm lazy. I cloned it from the base game Caress of Teak bed so I'm hoping it is base game compatible. I don't have a computer with just base game available for testing just yet. If it does not work with base game or any expansions prior to Pets, please let me know. It goes nicely with my Ashley Cataline End Table w/ Doors and/or my Ashley Cataline End Table w/ Drawers and my Ashley Cataline Mirror. Recolor and Distribution policy: Feel free to recolor all you want. 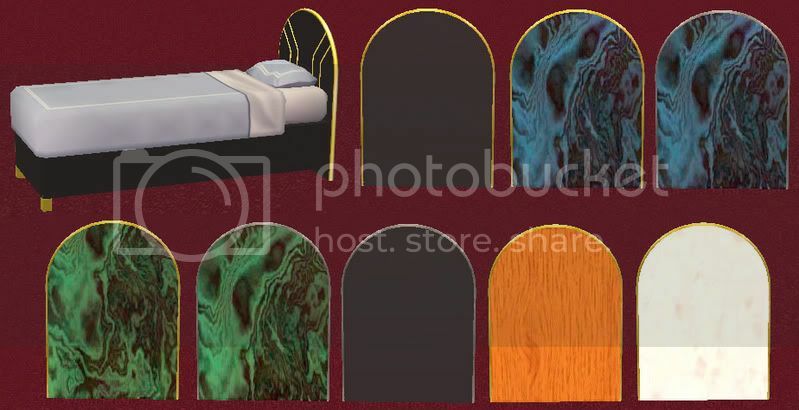 I idiot labelled my textures to make things easier for myself so hopefully they would not be difficult to work with. I would like all recolors to be available for free so if it is put on a paysite I would prefer it to only be in a free section and to have a link back to this thread. I want to be able to download all of the recolors for myself. :-) You may upload this in lots. I'm not really picky about the use. I want people to have fun. If you have any questions, please let me know. Thanks to Dadditude for inspiring me to make this. The mesh object has a rounded headboard with raised trim and accents. The main file is onyx with gold accents. The onyxsilver one is obviously onyx/black with silver accents. There are 2 versions of the lapis with gold. One has black on the back of the headboard. There are 2 versions of the lapis with silver. One has black on the back of the headboard. There are 2 versions of the malachite with gold. One has black on the back of the headboard. There are 2 versions of the malachite with silver. One has black on the back of the headboard. quartzgld is a white with other speckles with gold accents. woodgld is an orangey wood with gold accents. 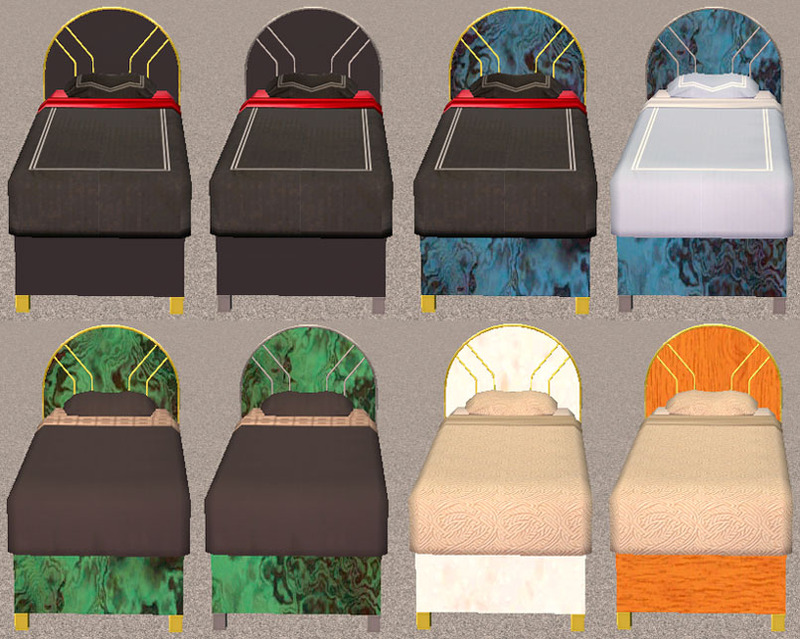 Here is a diagonal view of the primary bed and the backs of the various headboards. 86 people have said thanks to suceress for this download.